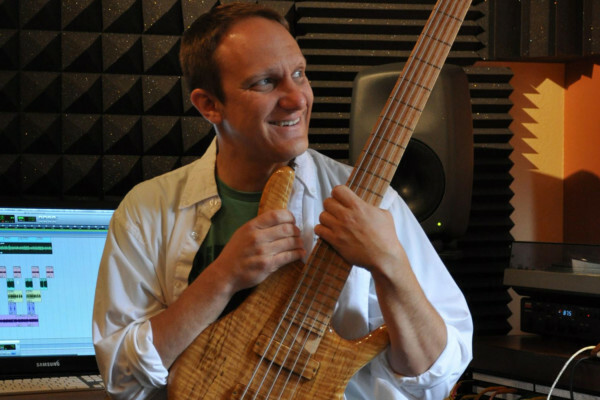 As one of the world’s most respected bass luthiers, Mike Lull’s work has been heard around the world. His Seattle, Washington-based shop has allowed Lull to work on nearly all of the instruments used by bands from the area known as “the grunge capital”, including Nirvana, Soundgarden, Pearl Jam and others. His story began as many do, with youthful rebellion, passion, and hard work, which he developed into a business. Currently, the Mike Lull Shop puts out around 300 boutique basses per year, with every one of them being assembled by the man himself. His most recent accomplishment is the introduction of the Jeff Ament Signature Model, which the Pearl Jam bassist helped design. The instrument is the first piece of endorsed gear to come from any member of the iconic band. We interviewed Mike to get the scoop on his story, as well as tips on setup, design, and getting into the business. How did you get your start in luthierie and building basses? A friend of mine’s parents had driven over this Teisco or some sort of cheap hollow-body 4-string bass, and they had crushed the body, but the neck was still good, the pickups were still good and the bridge was still fine. I bought it from them for two bucks, made a solid body in shop class, and just bolted on the neck and all the components and I had my bass guitar. During the whole process I was completely bitten by the whole “putting-your-stuff-together” thing, and the whole thing just sent me over the edge as far as wanting to do it more. I started noticing things as I became a better musician, although it took years for that to happen. As I would hear things, I would think, “How come my bass doesn’t sound like that?” So I started playing around and talking with guys at music stores that actually had somebody who knew what the hell was going on. There were a couple of different shops up here in Seattle that actually had people who were okay in the repair industry, and I learned more and more and more. In high school I started doing fret-dressing work. They had a Conn Strobotuner at my high school and they gave it to me on permanent loan. Nobody there knew how to use it, so I learned how to intonate guitars, and I learned all the ins and outs of setup. My biggest revelation was that the nut plays a critical role in getting your guitar play in tune. That was a lightbulb-over-my-head moment back in high school. Then towards the mid-70’s, the parts industry started to go crazy. I was working in bands and in local music stores, and all the sudden DiMarzio was making pickups. Then Schecter was making bodies, and Boogie Bodies was making necks. Stars Guitars was making bridges, and preamps were coming out from the Bartolini company. I started playing around with all this stuff and finding out what all these things could really do to your instruments. From there, it just blossomed. I started making advanced J-style basses and P-basses. I was a big Thunderbird guy – I love Thunderbird basses although I didn’t make then, but I’m doing that now instead [laughs]. One thing led to another, and pretty soon I had a very well-respected repair shop here in Seattle, and continue to have it to this day. We’ve worked on everybody’s stuff. It’s been a crazy, wild ride that’s been very rewarding monetarily, personally and professionally. It’s just been great. That was sixteen years ago and it’s just gone nothing but up. It’s been a great ride. My ultimate goal when I first started was to build about an instrument a day, you know, between 300 and 350 instruments a year. We just got to the 300 instrument mark this year. Now I’m thinking, “I guess I really can make as many instruments as I want to make.” The sky is the limit, but I don’t want to be a Fender or a Gibson or anybody like that. I don’t want to make 1,500 instruments a day, but a few hundred instruments a year has been a really good thing. I can keep total control over what’s going on with the instruments. I assemble every single one of these basses, so I have complete hands-on control over everything. How much help do you have in your shop? Well there’s four of us total. Paul Schuster is my general manager, and he handles all the parts and ordering everything and helping customers with the repair facility. He handles the customers and phone calls and emails and ordering parts… just keeping us organized so we can produce quickly if we need to. I have two other repair guys, Jeff Hope, who has been with me for about two years now, and Tom Albert, who has been with me for almost 20 years. They’re full-on repair guys. I still do a fair amount of repairs myself. I probably do 30 to 40 percent of repairs that come through the shop along with all the custom building. I’ve been working six and seven days a weeks since I was 18 years old. I’m not about ready to stop now [laughs]. I’m too trained at this point. I love this stuff. It’s really fun. A lot of your designs take cues from classic basses, and as you mentioned you’re a big T-bird fan. What do you think it is about those styles that keeps them so popular? Back in the ’70s when I was playing in a rock and roll band, nothing looked more “rock” than a Thunderbird bass. The Gibson Firebirds, Explorers and Thunderbird basses all just scream “rock and roll”. I loved the way Thunderbird basses sounded, and I loved the way they looked, but they were terrible ergonomically. They were headstock heavy and the body wanted to flip away from you, so you constantly had to be gripping the instrument as if your life depended on it. And I lost a couple of them along the way, due to being a little lax in hanging onto them [laughs]. I owned a bunch of those double and single pickup Thunderbirds in the ‘70s, and as I got older, my tastes changed. I became a different player. They still sounded great to me, but I couldn’t deal with the ergonomics of them, so I stopped using them. About four or five years ago, two of my clients came to me and said, “What would it take for you to make a Thunderbird bass?” I said, “Well, I’d want to do it so it sounded like the originals, but had all the ergonomics of more of a Fender-style bass.” So I kind of got dared to build one. I traced out a Thunderbird body owned by a friend of mine. I decided if I was going to do it, I was going to do it with a bolt-on neck so that if someone wanted [something] like an Entwistle-style “Fender-bird”, it was just a matter of bolting on a maple neck. I traced out the body and started carving it, then mounted one of my normal necks to it and saw that it was immediately better just because my peg head is so much lighter and smaller than a Gibson, but it still wanted to flip away from you. So I started playing around with the carve on the back of the body and on the top of the body, and the thickness of the body and such. I was able to change all the dynamics that make an instrument balance, and I got it to balance. I mean, it’s not a Jazz bass, don’t get me wrong. It’s not like where you let go of the strap and it stays right there. This instrument stays in the right place but it doesn’t hang like a Jazz bass. It hangs a little bit more parallel to the ground as opposed to an angle. But it’s way more comfortable and it doesn’t want to fall to the ground and it doesn’t want to flip away from you. I was able to fix all that on the 4-string bass and I transferred that over to the 5-string, but we had to design new pickups and redesign the whole body because the raised center section on a Thunderbird bass was not wide enough for 5-string pickups or a bridge and tailpiece. We had to change the body shape and design, still keeping the outside specs, and design new pickups. One of the things I had to have my basses sound like was the ’60s Thunderbird bass. The original Thunderbird pickups were a very special design that nobody has made since 1968. I took it upon myself to take apart a set of original pickups from 1964 that a friend of mine had and found out exactly what it was that made them tick, then I reverse engineered a pair of pickups. They sounded identical to the originals, so I knew I had the pickups, I knew I had the ergonomics of the body, and I knew I could have all the parts made for me. So I told them how much it would cost, and they paid me for their basses, which kind of paid me for the R&D that I had to go through to get all the pieces made. Then I was able transfer it to the 5-string, and also to the Firebird guitar, too. 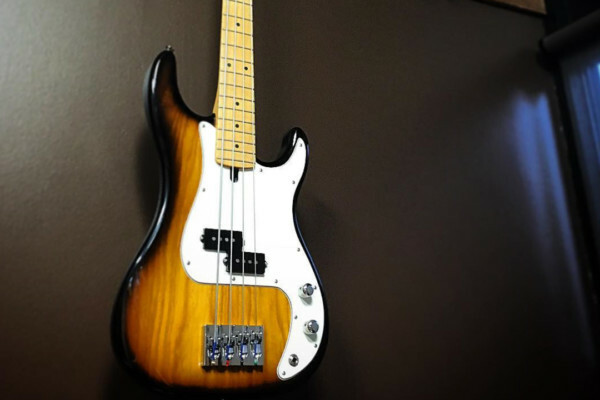 Getting back to those iconic designs – Leo Fender had it totally right when it came to a P-bass and a J-bass. I don’t want to reinvent the wheel. I just want to improve upon original ideas, so I took his designs and went a little further to make them better instruments. Same thing with the Thunderbirds. I’m taking the already iconic look of the Thunderbird bass and making it sound like the best ones that were ever produced but playing like a high end boutique instrument should. How did the Jeff Ament Signature Thunderbird come about? Then he tells me, “I love your peg head on this bass, but I want a reverse peg head and I want it 20% bigger, too.” Next he wanted the Rick Nielsen/Cheap Trick checkerboard look, which I had no idea how to get done unless the original artist who had done it for Rick Nielsen was still around. We looked him up, found him, and got him to do the graphics on the bass. We put it all together and Jeff just went completely crazy over it. He said, “This is the sound I’ve been looking for forever. This is the look, the feel, the sound, the balance.” Then he said, “I want to do a signature bass with my name on it,” which to me was an absolute coup, because Pearl Jam hasn’t done that with anything. None of the guys in the band have ever endorsed or had their name on an artist product, ever. So for me it was like, “Oh my God, this is breaking the mold.” And Jeff has been absolutely, intimately involved with every aspect of this bass. Not only the body size and the peg head shape, but the colors, the price point of the instrument, he designed a pickguard for the bass… he’s behind it 100%. I was stunned. It’s a high-end bass for sure, but this is a custom piece. I make every single one of these myself, so the whole idea is a custom Jeff Ament bass. 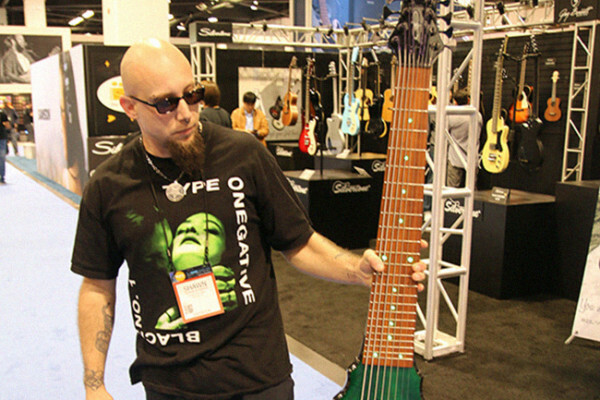 What do you think about extended string basses and other designs? I’m not into it myself, and because I don’t play on a 6- or 7-string bass, I don’t feel comfortable doing that. I’ve worked on many, many, many of them, I just don’t feel that’s my niche. My niche is 4- and 5-string basses. That’s where I excel, it’s what I like, and it’s what I stay with. I know you’re a gigging bassist still… I assume you play your own basses? Oh yeah, I’ve got a couple of basses I built for myself- a 5-string Jazz and my bass that I play 80% of the time is my P4, one of my P-basses. It’s just a really nice lightweight Alder body with a Brazilian rosewood fingerboard and a custom Lindy Fralin P-bass pickup that he made for me. It’s a tremendous sounding bass, and it does 80% percent of everything I need to do. The other 20% are taken up by either my 5-string Jazz or I’ve got a couple of vintage Fender P-basses that I use from time to time also. One is a ’59, the other is a ’64. For vintage guys, that’s worth drooling over. And these are two of the nicest basses you’ll ever play. I feel extremely fortunate to have them. I’ve had hundreds of basses over the years. I used to have quite a large collection in the ’90s, and then ended up selling it in 2000 just because I have four kids and a family. The money was needed in other places like my house and college funds, and such like that. That other “life” stuff. But I’ve always tried to keep one or two Fender basses in my collection. I’m fortunate to have those two, but I don’t play them that often. I play my own personal stuff I make more. It’s more consistent, more fun to play, easier to play, and they sound as good as any vintage bass out there without the idiosyncratic behaviors that vintage basses have. How can bassists find their own sound? That’s a good one, because when I was growing up I was completely taken by John Entwistle and Chris Squire. Both British bassists at the time were playing bright and ballsy, and so all through the ‘70s I emulated that. I wanted a big low end to move some air, but I wanted to be heard and I wanted that crunch; that ballsy tone that those guys got. Well you know, you get older and you mutate your tastes. One of my bass heroes now is Lee Sklar, who is a studio ace and plays with everybody. Last time I saw him he was playing with Lyle Lovett. He and Russ Kunkel, the drummer, just made the whole band move. And so, as your tastes change, you mutate your sound. I would say go with the bands and the musicians that you’re listening to. If that’s the tone that you like, try to emulate it as closely as possible. I mean, I could get into technical stuff like, “Turn up 250Hz by 3dB,” and so on, but without knowing what kind of amp and what kind of bass they’re playing through, it’s kind of a tough thing to say. I would just say try your best to emulate the people who you have as instrument heroes. Do you have tips for people trying to do their own setups? Sure! There’s a couple of good books out there. One of them is the Guitar Player Repair Guide by Dan Erlewine, who is one of the writers for the Stewart MacDonald company and has also written for Guitar Player and Bass Player and several other magazines. It’s a wealth of information as far as setup goes. Some of the key issues when it comes to setup work that people don’t realize is how critical little things like the nut, which is the piece that holds the strings on over the fretboard up by the tuning machines, is to getting your bass to play in tune properly. It controls the intonation at your first fret, and if it’s not cut correctly, it’s not going to play in tune at your first fret. Then it won’t play in tune up and down the neck. It might play in tune in certain areas, but in other areas it will still be out of tune. But there are a lot of key issues. Neck relief is a big one when it comes to bass guitars. A lot of people think you need to have a dead-straight neck, and I’m here to tell you that generally doesn’t work for 95% of the bass playing population. Most people need to have a fair relief or forward bow in their neck for their strings to play cleanly on the fingerboard, especially when they try to dig in at all. It’s a rare person who can make a bass with a dead-straight neck play clean. Most people can’t. String height is another big issue. [As for] how high your pickups are and how close they are to your strings; a lot of people think the closer, the better. Well, you get to a point of diminishing returns of how close your pickups are because the magnets can actually pull your strings down and cause fret buzz as well as what they call wolf tones, or overtones that sound really nasty. The main thing is they can cause fret buzz. So, they key issues are neck relief, getting the nut cut to the proper height and breakaway, setting your strings to the height that you want, and then setting the intonation with a qualified tuner of some kind. It’s got to be something with an advanced meter system of some kind that is accurate enough to set the intonation at the twelfth fret. There’s often debate about this: how much do you think wood affect your tone? I think it’s dramatic. You know, an alder body sounds completely different than a swamp ash body, and a mahogany body sounds completely different from either one of those. Rosewood fingerboards have got a ton more midrange response than a maple neck does and a maple neck has got more high end clarity than a rosewood fingerboard has. It’s a matter of application. If you want to have a nice punchy, full sounding bass with just the right amount of articulation, a rosewood fingerboard with an alder body is a very common choice. If you want to be nice and snappy and have the perfect slap tone, most people would want to try something like a swamp ash body with a maple neck. That has the most natural acoustic tone to transfer over to slap with. There are a number of other exotic hardwoods. I try to stay away from what people call coffee table basses, with multiple laminates of hardwoods. [The companies that make them] are good builders, they just have different ideas of what tones they want to get. Also, a neck-thru instrument has way more fundamental note to the string. When you pluck a string, you have a fundamental – on your E string it’s about 40Hz – but then you have harmonics of all of that. The harmonic content of the string is what’s going to give your ear the sound of whether it’s really full and bass-y sounding or whether it’s nice, tight and punchy sounding. A bolt-on neck has far less fundamental in the note and more overtones, so it sounds tighter and punchier. A neck-thru instrument is going to sound like it has much more low-end response and less high-end response because of that design. I think all of these factors are critical in getting the sound that you want. They all change the sound of your instrument. What are some of the lighter woods, for those with back issues? Louisiana Southern Ash, which is what swamp ash is, varies in weight dramatically. The bottom portion of the tree is very light, while the middle is kind of medium weight the top of the tree is heavy. We’ve all seen vintage Fender basses from the late ‘60s and early ‘70s that weighed thirteen pounds and were just exceedingly heavy. That was just a different portion of the tree that was being used. Most of the lightweight alder is gone. Lightweight alder would be old growth stuff. Most of that wood is gone, because alder was considered a firewood over here on the West Coast in particular, and those groves of those big trees are gone and they’re using newer wood. We’re chambering our alder bodies to get the weight the way we want it to be, which is coming in at about seven and a half to eight pounds. Some are a little lighter, some a little heavier, but nothing is over nine pounds. The five-strings come in between eight and nine pounds. By chambering the alder bodies, we’re able to keep that weight factor down, which makes them sound much more like the vintage basses from the ‘50s and ‘60s. So weight is a big factor. It’s interesting that the actual part of the tree makes all the difference. Yeah, I was taught that by a lumber guy years ago. I always wanted the lightest weight swamp ash and figured, it was the swamp ash tree! Just cut me some good pieces off of it! [laughs] He said, “No, no, no. You don’t understand. This 30% of the tree down here is nice and lightweight. That’s what everybody wants. The middle of the tree is another 25% heavier, and the top of the tree is all heavyweight stuff.” They can’t pick and choose the tree. These lumber guys get a tree, cut it up and they have to use it. You have to pick and choose what it is you’re getting from these guys. Do you have recommendations for people who want to build their own basses? I would highly recommend you look into a building school. You know, something like Roberto-Venn School of Luthiery. My employee Tom Albert went there 20 years ago. Not everybody comes out of that school a master luthier, but at least it gives you a clue as to what’s going on and see if you have the potential to really develop that. You can read about hammering a nail into a board all you want, and how to use a hammer and so on, but until you pick it up and actually try pounding a nail into a board you have no idea what it’s going to be like. So I highly recommend people look at some of these schools. The Red Wing Institute, Roberto-Venn, there’s a couple more on the East Coast. That would be the most effective way to use your time to see if you’re really into it. Get the skills. From there, that becomes the tricky part. Actually making a business to do it can be the trickiest part. The government and society don’t make it very easy for you to be self-employed. Your tax situations and how you have to do business is difficult. I took a small business class when I first got into having my own business 35 years ago, and the first thing the teacher said was, “95% of you aren’t going to be here in a year. The next 90% of the 5% left are not going to be here in three years. That’s how many people succeed at having their own business.” There are a lot of pitfalls and you have to watch yourself. But if you’re smart, you’ve got a good product, and you go at it slowly and determined to succeed, attitude is everything. You’ll win over. Life is a big learning adventure, and everyday I’m learning something new. Even at 58 years of age, there’s still something every day that I come away with. That’s what you need to have. You need to be learning all the time in order to succeed. Special thanks to our Facebook friends who contributed questions: Tom Clarke, Victor DiBono, Nick Cornell, Chris Bool, Jim Coutu, John Contreras, Kevin Lederer, and Brandon Drake. Best piece I’ve read on No Treble so far. Very thoughtful content. Thanks Daniel. Love to hear the feedback and glad you enjoyed it. Corey Brown, details included by the writer make all the difference. He gets the narrative of Lull’s shop history and specific concerns and innovations Lull was/is concerned with. He also lets Lull say what he feels important, and doesn’t ask any shallow or leading questions, which breaks with the crucial flaw of reporting today whether its about war abroad or local business. Excellent article! Having been a cabinet and furniture maker and antique restorer for many years, and a bass player even longer, I really appreciate a well written article on wood working especially when it has to do with one of my favorite topics. I am in the process of restoring a 78-79 Fender fret less P and some of the info here will come in handy ;). Thanks, excellent article and class act. Good story — small business guy does well, and has fun in the meantime. Thanks for a great and enlightening read. I’ve just finished my first build, a fretless 5, in a very unconventional manner with very pleasing results. Mike’s comments on bass building validate some of the ‘eureka moments’ I made on my journey. Compliments of the season everyone..
Mike Lull is one of the best fret guys ever. I’m very happy with the work he did on my vintage Fender Jazz bass. Awesome interview.. I play for a living..and I’ve been playing for 38 years and I just love to read about people with a passion for what they do.. And how a driven, talented person shares his passion in his product by sinking himself into the knowledge of the wood..and where it comes from..how old, heavy or today’s availability of certain woods is.. I’ve never brought myself to buy his boutique brand.. But, this piece draws me closer to getting my hands on one.. Nice, very nicely done.